The most important party in China is coming: the Chinese New Year 2019. In this occasion, it will take place on February 5th. 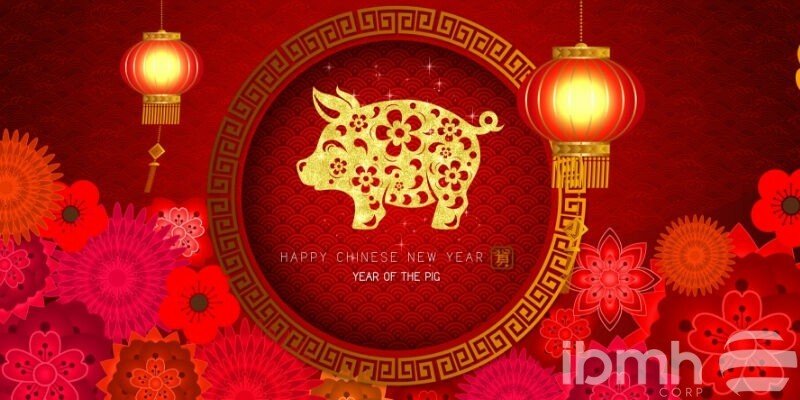 To be aware and anticipate the unforeseen taking into account how the Chinese New Year affects the import of hardware is a good strategy and from IBMH we are always ready to help you solve any kind of problem that may arise. This ancient tradition is governed by the lunar calendar, contrary to the West where the Gregorian calendar governs. Thus, in China and other Asian countries such as Korea or Japan, the year-end date varies between late January and mid-February. Chinese New Year is also known as the Spring Festival. This year will mark the beginning of the year of the Pig. According to legend, Huang Di, the Yellow Emperor, named an animal to represent each year in the twelve year cycle. The Chinese New year is very important in this country. It symbolizes a time of reflection, resolutions and hope for the coming year. This is a period full of celebrations and marked by visits to relatives, special meals and fireworks. It ends with the well-known Lantern Festival, fifteen days later. When you work in a country like China (as is our case) it is essential to be aware of how the Chinese New Year affects the importation of hardware. The official vacations the government makes are one week. But the reality is that the country is almost completely paralyzed for a whole month. Some factories close a week before New Year’s Day while others do so until two weeks earlier. What are the consequences? Some vendors stop accepting orders since December. Production time is delayed and quotation requests are processed more slowly. So sending purchase orders with much more time also minimizes problems. Ports and customs operate with a minimum of personnel, giving priority only to perishable products. Companies that manufacture in this country must rush to finish their products before the holidays. This makes that in less time they produce higher amounts than the usual and, therefore, it is necessary to monitor that there are no variations in quality with a specialized partner, such as IBMH. Stress increased in the supply chain. This leads to high congestion and major capacity problems for carriers. We will help you to manage your production with Chinese manufacturers so that it does not affect any circumstance to your imports. The agreed production dates will always be fulfilled, with no last-minute surprises. We always seek the best suppliers to guarantee their solvency before any unforeseen. We know the best manufacturers in all industrial areas of the country. Also those who do not attend international fairs in the sector. We are a preferred partner that providers give priority when necessary. For the high level of purchase that brings us the joint negotiation for all our customers, we can get better conditions for your purchases. We know perfectly well how to work in this country. For our vast knowledge of the Asian market, we dominate the way of negotiation and internal operation of the Chinese companies and manufacturers of hardware to help you to manage fully and strategically all your import business. With our more than 24 years of experience in the Asian market, we are able to efficiently meet the most demanding applications. IBMH can help you be aware of how the Chinese New Year affects the importation of hardware or any other reason that may influence your hardware production in this country. But also, working in China as an extension of your own company, we can collaborate with your purchasing department to optimize your resources efficiently and achieve maximum profitability for your business. Contact us today!